The role of the ‘frit’ (or wick): For a pH meter with a single combination electrode to work properly there must be an electrical connection between the electrode filling solution (usually potassium chloride – which is electrically conductive) and the sample solution. This is achieved via the use of a porous frit or wick (Fig 10.5, 10.8) in the glass wall that separates the inner filling solution chamber from the sample. Both these devices allow the free yet very slow flow of the filling solution into the sample solution. The blockage of this frit is the most common cause of pH meter failure and is a consequence of either dry storage or contamination - see below. Dry storage of pH electrodes: Dry storage causes dehydration of the glass electrode and the precipitation of salts within the interstices of the frit itself (Fig 10.8). The consequences are reading drift, slow response times and loss of accuracy and precision. To avoid these problems the electrode tip must be permanently stored in a specially formulated storage solution (Fig 10.6). Note, pH buffers 7.0 or 4.0 and distilled water are not suitable for storing pH electrodes as they can upset the electrode calibration. 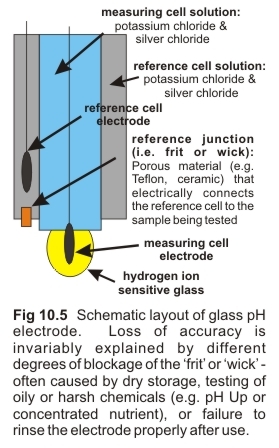 pH electrode contamination: Unless the ‘frit’ and glass tip of a pH meter electrode is properly cleaned after use, it will invariably become contaminated with impurities (Fig 10.7). This causes similar symptoms to dry storage. Contamination may be so severe that re-calibration is not possible without prior cleaning or replacement. ● Avoid measuring harsh chemicals such as highly caustic solutions (e.g. pH Up and silica additives), or concentrated solutions such as raw nutrient. ● Avoid placing the electrode in oily solutions as they can “coat” the electrode. ● Filter water samples that are potentially a problem (i.e. greasy) prior to performing a pH measurement. 2. Clean the electrode regularly using an electrode cleaner. Be aware that most cleaners are only designed to remove inorganic contaminants. Therefore if the nutrient solution contains organic additives, an all-purpose cleaner may be required. Even if pH electrodes are properly calibrated, do not assume they are always accurate. The reality is that different pH meters occasionally give different readings on a given sample even when each is calibrated on the same set of buffers. The existence of pH meter error can be determined by measuring a nutrient sample using two different pH meters. With this exercise it is not uncommon to get pH readings that differ by up to 0.5 pH units. This occurs because some electrodes can respond to other 'species', such as sodium, which are electrochemically similar to hydrogen ions.